Picture a middle-school classroom. There are many children of similar ages, each with their own set of unique skills and varying levels of interest in academic performance. When talking to the science teacher after class, you notice that she talks about each student differently - she gushes about Julie’s motivation to learn and her interest in science. When talking about Daniel, the teacher expresses concern that he does not seem as motivated in academic performance as he ought to be. How does the teacher arrive at this conclusion and gauge a student’s motivation? These conclusions can be drawn from several observations. One of them is how attentiveness is perceived by the teacher. This teacher has noticed that Julie displays an exceptional amount of attention in science class and often talks about being a scientist, so she considers Julie to be a scientifically-motivated child. Another indicator of motivation is the child’s eagerness and commitment to engage with the material. In Daniel’s case, the teacher notices that he is the slowest to complete assignments and does not seem to enjoy science projects. Thus, she comes to the conclusion that Daniel is not a scientifically-motivated child. In both Julie’s and Daniel’s cases, their motivation is a crucial factor for how they are assessed in the classroom. Psychology defines motivation as the process that helps initiate, guide, and maintain goal-oriented behaviors. As we observed in both of the above cases, we can infer a person’s motivation by observing their behavior and interpreting it in a particular way. The motivational theory most relevant to our classroom situation is incentive theory. Here, motivation is divided into two types - intrinsic and extrinsic.. Intrinsic motivation refers to the innate desire to seek out new learning experiences, and is independent of any external pressures or rewards to seek out these experiences. For example, Julie’s desire to be a scientist stems from her general interest in science and the world around her, which translates to her performance in science. Extrinsic motivation refers to external agents, usually rewards or punishments, that influence the drive to learn or seek new experiences. In intrinsically motivated behaviors, the reward is the activity itself. The relationship between intrinsic and extrinsic motivation is best represented as two ends of a spectrum. Extrinsic motivation varies greatly depending on the extent of the autonomy present in each situation. To illustrate this point, let’s fast forward to when Julie and Daniel are in high school. For Julie, paying for college is not in her family’s means, so she realizes she has to receive a full scholarship in order to fulfill her dream of becoming a scientist. She now has to compete against other applicants for the scholarship, and in order to do that, she has to get great grades. Julie is now heavily influenced by external agents such as grades, competition, and money - she is no longer only motivated by her love for science. Daniel is also considering pursuing science in college, but only because his parents and teachers believe that a a degree in STEM will afford better employment opportunities than studying English, which is what he really wants to do. In this situation, Julie is influenced by external factors, but still retains her choice and her autonomy in that she chooses to study science because she enjoys it. By contrast, Daniel is only motivated extrinsically - he has no internal drive to study science since he lacks autonomy in this situation. Studies have shown that extrinsic and intrinsic motivation can have very different effects on student learning. Nearly two decades ago, Ryan and Connell (1989) found that extrinsically-motivated students who had very little autonomy over their choices displayed less interest, value, and effort while learning. These students also displayed a higher tendency to blame others for negative outcomes. Extrinsically-motivated students with greater autonomy over their choices (such as Julie) showed greater effort, but also had higher anxiety levels and displayed poor mechanisms to cope with failure. In contrast, intrinsically-motivated students showed greater interest, enjoyment, and feelings of competence, and also displayed healthy coping mechanisms when stumbling across obstacles. These effects are also different with respect to age - recent studies provide evidence to support the theory that extrinsic motivation does not have negative effects on achievement in elementary-age children, but it does impair achievement and academic performance in older children. Given the relationship between motivation and achievement, how do we encourage positive motivational behaviors in individuals? We can begin by looking at evidence supporting various influences on the development or suppression of each kind of motivation. A study by Murayama, Matsumoto et al. provided evidence suggesting that performance-based reward systems can actually undermine the development of intrinsic motivation. Participants participated in a task that captured their interest and required some effort, and were offered monetary rewards for successful performance. In another round, they were told they would no longer receive rewards for success. Results showed that the brain regions responsible for coding value showed decreased activity once the rewards were stopped, as did the brain region responsible for increased cognitive engagement. Essentially, this study revealed that individuals were motivated to learn while receiving rewards, but stopping these rewards significantly decreased their motivation to learn. In another set of studies, researchers looked at how students’ beliefs about themselves affected their performance when faced with challenges. One of the most popular theories in this space discusses how people’s beliefs about their intellectual ability can affect the way they learn. This research suggests that people who subscribe mostly to entity theories of intelligence believe that intelligence is mostly fixed. These people tend to pursue goals/tasks that help them appear capable and are quick to give up if the outcome of their effort is negative. Contrastingly, incremental theorists are people who believe that intelligence is something that can be developed with time and experience. These individuals pursue tasks and goals that help them master skills and embrace challenges, even if it seems like their efforts first beget negative results. Those who believe in incremental theories of intelligence tend to be more intrinsically motivated than those who believe in entity theories, since their interest in learning makes them more likely to pursue mastery. Importantly, these individuals develop better coping mechanisms to deal with failure since they don’t necessarily view their performance as a measure of their ability. So how can we apply the findings from these studies to encourage intrinsic motivation in students? In 2002, Aronson, Fried and Good taught incremental theory to a college students, and observed that these students actually earned better grades after the training compared to students who hadn’t been trained. A similar intervention conducted in high schools also showed the same effect - the trained adolescents (i.e. ones who were taught about incremental theory) scored higher on achievement tests than their untrained peers. This is heartening news, because it tells us that teaching students how to view their intelligence has real effects on improving learning outcomes. Other studies have shown that specific kinds of encouragement from teachers and parents promote intrinsic motivation in students. For instance, punishments have been shown to decrease intrinsic motivation and increase extrinsic motivation in students, regardless of age. In another study, researchers found that the best way to encourage middle-school children to read was to offer them a new book (or another reading-related reward like a bookmark) as a reward for finishing a book. These studies, when considered in conjunction with the performance-based reward study we discussed earlier, suggest that a good way to foster intrinsic motivation in students is to create a learning situation in which the activity itself is the reward, and negative learning outcomes are not penalized by external agents. Research has helped us identify the existence of different kinds of motivation and the possible factors influencing their development. Although more research is necessary to better understand the more nuanced features of motivation and its influences on learning, there is sufficient evidence to suggest that a large number of currently-practiced policies in schools may not have the desired effect in promoting positive learning outcomes in students. Going forward, it is important to ensure that policy mechanisms develop alongside scientific progress in order to ensure that research can be adequately implemented in the classroom, thus ensuring a better educational environment for every child. Aparna is a senior studying Cognitive Science at the University of Pennsylvania, with a concentration in Cognitive Neuroscience. She is also double-minoring in Psychology and Computational Neuroscience. Aparna has volunteered for the Changing Brain Lab since Fall 2017, and will be graduating this summer to pursue an interdisciplinary fellowship (teaching, education policy and research) in India for the next two years. Any questions can be emailed to apram@sas.upenn.edu. This opening quote was the perspective that Harvard University’s neuromolecular biologist Dr. Takao Hensch implemented in his talk about manipulating brain plasticity. Children are faster than adults when learning motor outputs, languages, and a plethora of other skills necessary for development. You may know names such as Mozart or Serena Williams; their success in composing and tennis, respectively, was the result of an accumulation of years of experience within these fields. It may not be surprising that people who have achieved great performances often start early in life and acquire the skills that made them extraordinary. Brain plasticity, or the brain’s “willingness to change,” is one way to explain a child’s malleability to early experience. Interestingly, this plasticity is different throughout an individual’s lifespan. For example, let’s look at something that mostly all humans eventually acquire in their skills repertoire: the ability to speak and comprehend language. It’s truly extraordinary to see an infant with near-zero comprehension of language develop a full working vocabulary by the age of four. But what’s truly perplexing is that the same child, when older, struggles significantly more when trying to learn a new language. How can humans be so proficient at acquiring a language with zero past experience during one point of their life, yet so much worse at acquiring new languages later in life -- when they have already developed the neural mechanisms necessary for language? This period Hensch refers to is the critical period. Critical periods can be understood as windows of opportunity, in which early experiences can shape brain function for a variety of processes, such as vision and language. During the critical period for language, for example, a child’s exposure to language is extremely influential on the wiring of her brain; thus, she learns at a very efficient rate. However once her critical period closes later in life, her plasticity to experience decreases, and thus she learns languages slower and with more effort. So how does experience translate into changing neural connections? Well, these experiences serve as sensory inputs to two types of neurons in the brain: excitatory neurons and inhibitory neurons. It’s through their communication which makes all the magic happen. 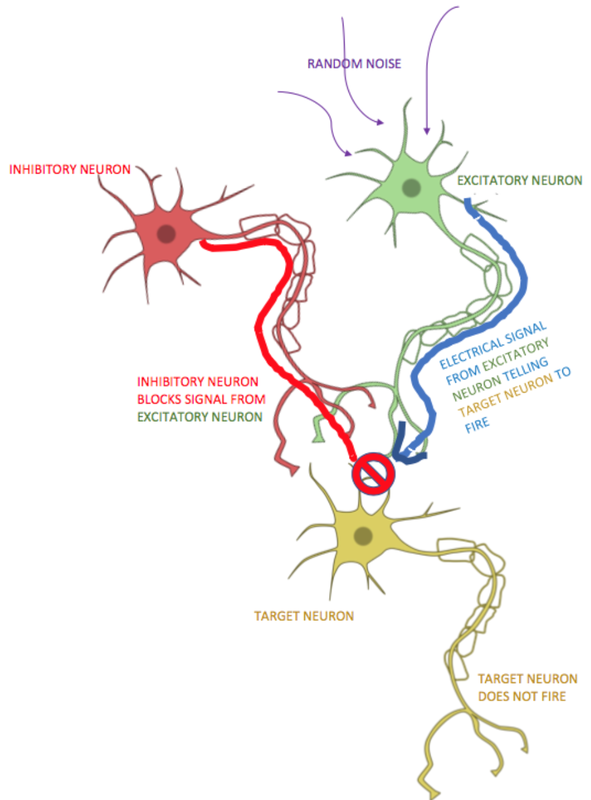 Excitatory neurons drive target cells towards being active and inhibitory neurons prevent target cells from firing action potentials (the method of communication between neurons). Historically, research has been more interested in the implications of excitatory cells because they far outnumber inhibitory cells; the accepted thought was that you need to excite the brain to induce change. However, recent research has indicated that inhibitory circuitry is behind these highly plastic periods of learning. There are a few theories that explain why inhibitory neurons are necessary for critical periods. One explanation is that neural inhibition sharpens the signal-to-noise ratio. Think about an outdated TV set. While watching the screen, sometimes you may see a bunch of little dots that don’t contribute to the the clarity of the picture. These dots are the noise, whereas the picture is the signal. We see in newer TV models that these white dots are almost unrecognizable -- indicating that companies have effectively worked to sharpen the signal-to-noise ratio. This analogy can be understood when thinking of inhibitory cells as the TV companies, incoming sensory information as the picture, and noise as all the extra stuff we pick up that our bodies don’t really want to process. Research has shown that immature brains before critical periods have a lot of this “noise”, or spontaneous activity not driven by sensory input. And just like TV companies worked on strengthening this signal-to-noise ratio, our neural system ultimately works to get stronger. Furthermore, the rules of “neurons that fire together wire together” and “neurons out of sync lose their link” are the underlying mechanisms to how some of this noise is lost and signal strength is increased. Adding inhibitory networks allows responses to get sharper and the noise signal to be preferentially dampened. So what’s the point of understanding how and why critical periods happen? Interestingly, understanding environmental effects on neural networks can have great implications for society, particularly in education. Preliminary research on neuroplasticity in cats looked at their visual systems and how the environment influences maturation (Frégnac & Imbert, 1978). That is, early environmental disadvantage (such as perpetual darkness) can prevent visual development in cats. This knowledge of environmental influence on visual systems was also found to apply to humans, as well. Researchers found that when it came to certain visual deficits (ie Amblyopia or lazy eye), the effectiveness of the treatment interventions was highly dependent on the age of the subject (Holmes et al., 2011). Dr. Allyson Mackey and Dr. Emily Cooper evaluated implications of such findings in their review Sensory and cognitive plasticity: implications for academic interventions. This idea of critical time periods for development, when extended to other neural systems, reveal that other forms of environmental disadvantage (e.g. low SES status, lack of available resources, early childhood stress, etc.) significantly affect cognitive development. However, Dr. Mackey and Dr. Cooper stressed that it’s important to understand that early interventions are not necessarily optimal if they take place before the critical period opens. Moving toward neuroscientific applications within society, understanding trajectories of developmental neural plasticity could be extremely helpful when determining the timing of interventions aiming to ameliorate environmental disadvantages of children in high-risk communities. Jessica is a junior studying Cognitive Science at the University of Pennsylvania, with a concentration in Cognitive Neuroscience. She is also double-minoring in Psychology and Urban Education: Policy, Research, and Practice. Jessica has volunteered for The Changing Brain Lab since the Fall of 2017. Any questions can be emailed to jege@sas.upenn.edu. How does socioeconomic status affect brain development, and can neuroscience aid in the effort to alleviate global child poverty? As Dr. Martha Farah, the director of the Penn Center for Neuroscience & Society, says: “We’re not here because we want more photogenic brains on an MRI. We don’t really care about their brains as an end in itself. We care about their lives and the neuroscience is only interesting insofar as it tells us something about that.” A working group with diverse research backgrounds put on the Global Childhood Poverty and Neuroscience workshops to attempt to shed some light on issues pertaining to brain development, neuroscience, and child poverty. Included in the first workshop was Dr. Martha Farah; Dr. Sebastian Lipina, a visiting academic from the National Council of Research (CONICET) in Argentina; and Dr. Allyson Mackey from Penn Psychology. Dr. Farah presented research showing the widening gap in academic performance between children of higher and lower socioeconomic status (SES). A 2009 study by Stevens et al. looked at the effect of SES on attention by simultaneously playing two different stories in each participant's ear while asking them to attune to only one of the stories. Participants with lower parental education attainment had a harder time focusing their attention on one of the stories. Why does this difference exist? It is possible that this difference stems from higher unpredictability in lower SES households, where it could be more advantageous to have one’s attention spread out and attuned to many different things at once. However, this finding can also mean that kids from lower SES backgrounds have trouble paying attention to just one thing, which can be a problem in a busy classroom. Dr. Farah also discussed a Demir et al. paper from 2015 that looked at brain activity correlated with better math performance. It was found that better math performance was correlated with activity in verbal regions of the brain in children from higher SES backgrounds. However, for children from lower SES backgrounds, visual and spatial areas of the brain were correlated with better math performance. This finding provided evidence that SES is associated with the way the brain processes information, which can have numerous practical implications about the way math can best be taught to kids from lower SES backgrounds, such as demonstrating math visually rather than verbally describing how something works. Together, these studies look beyond just gaps in test scores and provide evidence for specific learning differences in children from varying SES backgrounds. Dr. Mackey corroborated Dr. Farah's presentation by discussing how children from a lower SES background are more likely to be exposed to a number of risk factors that impact brain development, and how low SES exacerbates those risks.These include physical risks (e.g. pesticides, lead) as well as physiological risks (e.g. sleep disruption, lack of exercise, poor medical care, malnutrition). Additionally, there are psycho-social elements such as discrimination, eviction, crime, incarceration, unstable families, addiction, and low quality schools. All of these factors are stressors on child brain development. For the workshop, Dr. Mackey particularly discussed how stress and sleep deprivation can lead to changes the brain. Evidence suggests that early life stress alters the reward system in mice (Peña et al. 2017). Mice who were stressed in early life and then encountered social stress in adulthood developed depression-like behaviors (Peña et al. 2017). While mice and humans are different, children who have experienced more stressful life events have weakened connectivity between certain areas of the brain, potentially indicating a weakening level of neuroplasticity in children, which can make it increasingly difficult to learn new things (Park et al in prep). Sleep is another domain in which low SES can exacerbate risk factors associated with brain development. Children from lower SES households are at a higher risk for poor sleep quality compared to children from higher SES households (Buckhalt et al 2011). For kids from lower SES, sleep loss is associated with a great reduction in cognitive performance. Sleep disturbances are also associated with reduced whole brain volume and dorsolateral prefrontal thickness, an area that is important in complex problem solving and decision making. (Kocevska et al 2016). However, for children from higher SES who do not see the same reduction as those who experience sleep loss and are of lower SES, this is not the case. Parents who are concerned about how sleep quality might be affecting their child’s brain development can track their child’s sleep to help determine if there are poor sleep conditions at home. There are also specific steps that can be taken for parents who want their children to sleep better, such as making sure the child has a consistent bedtime and limiting media use around bedtime. Despite all of this research that link SES and brain development, the path from research to policy is a long one. This reality was demonstrated to the audience with the example of the state’s car seat policy - it took 10 years for Pennsylvania to change the policy regarding car seats for children under 2 years old after a study was published saying children under the age of 2 are 75% less likely to die or be severely injured in a crash if they are sitting rear-facing. Because it takes so long for science to influence policy, it is important to think about the small steps parents and educators can take now. Neuroscience can have real world effects that can make a difference in children’s lives, and fortunately, the field is filled with scientists who are committed to thinking about the real-world implications of their research. Anna is a senior at Vassar College where she studies Neuroscience with a focus on evolution. She volunteered in The Changing Brain lab this summer. Anna can be reached at anmeaney@vassar.edu with any questions.